ASCII text communication is convenient for debugging, but it's not particular efficient. The microcontroller is having to take a string of characters, convert those strings into numbers, then process the instructions of those numbers. Total 10 bytes as ASCII (including carriage returns). Binary communication is much more efficient. A pointer can be used to interpret the array of bytes as a structure, so there is no CPU expensive conversions from strings to numbers. And where ASCII would take 5 bytes to represent 65535, binary would need just 2. We'll say command 1 is to set a percent value. Total 5 bytes as binary. 5 bytes instead of 10! But let's make the example more interesting. We'll say command 2 is to set an upper pulse value. We want to control servo 10,000 to a pulse value of 1100. Total 15 bytes as ASCII (includes carriage returns). 5 bytes instead of 15! Now imagine we were sending 10,000 servo commands, saving 10 bytes per command. 100 KB is a nice savings over a serial cable. That saves on the amount of data we're sending over, but what about interpreting the data? String manipulation is a (relatively) slow process. In C, you can use a pointer to interpret that array of bytes as whatever structure you wish. In the examples above I listed out the byte array for values such as 12 -  and 10,000 - . But why is it  and not  and where do you get 16 and 39 from 10,000? The computer your code is running on could order variables either way. It doesn't matter which order is used, just so long as both ends of the communication use the same one. Swapping the order of the bytes is trivial, and there are plenty of examples around on how to do that. 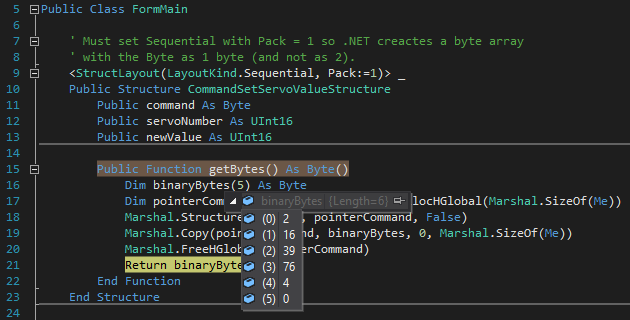 Since my .NET application and my Arduino use the same byte order, I didn't have to do any byte swapping. 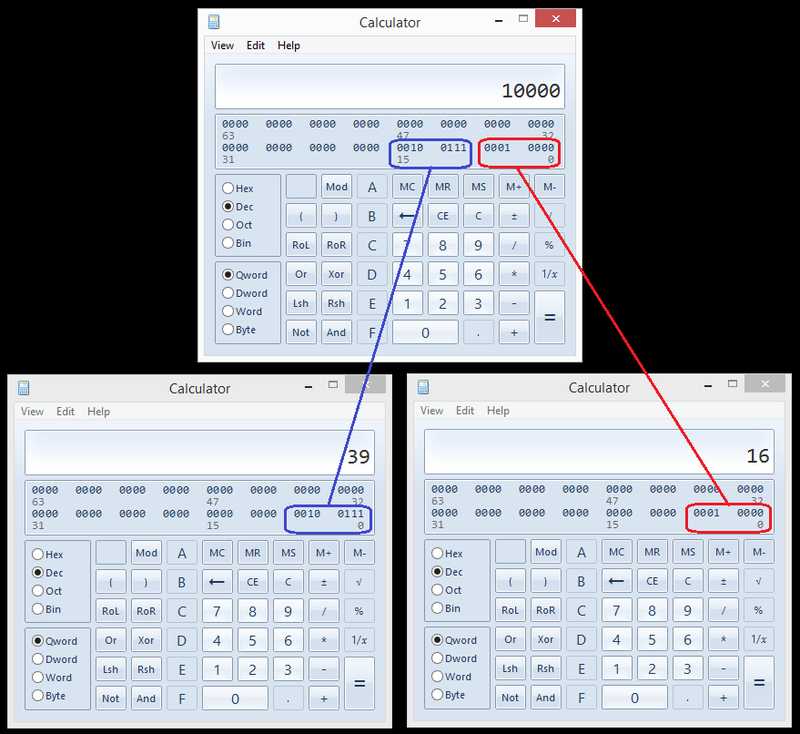 Windows Calculator has a Programmer mode (under the View menu) that comes in very handy. I've switched to Programmer mode, selected "Dec", and typed in 10000. I then opened 2 more Calculators; entering the "more significant" byte into one and the "less significant" byte into the other. Now you can see where the 16 and 39 mentioned earlier come from! Rather than lose the ASCII debugging mode, I'm going to modify the code to support both kinds of input. When the microcontroller first starts, if the user presses the ENTER key (new line), then it goes into ASCII mode. If the program sends a character code of 128 (an extended code a user is unlikely to type), then it goes into binary mode. The main program loop of the Arduino continuously checks if data is available over the Serial line. If the input mode has never been defined, then it calls getSerialInputMode() to determine which input it is in. After the input mode has been determined, it will route all incoming Serial input to the appropriate parser - getSerialASCIICommand() or getSerialBinaryCommand(). The getSerialASCIICommand() function is basically how the commands were parsed before. // Echo back the command. The getSerialBinaryCommand() is the new code. We'll define a byte array and a variable to keep track of where we are in that array. Upon receiving a byte over the Serial line, it stores it in the byte array and increments the position. The very first byte of the array is the command. So once we get that first byte, we can determine if we've received enough bytes for our structure and then process as appropriate. For now all the commands use the same structure and thus are the same length. However, that will very likely change in the future with more advanced commands. // and are handled fine. // Reset incoming array position for next command. Processing each command is very efficient: Interpret the incoming bytes as a structure, then read the values.